by HouseWorks LLC and Reader & Swartz Architects, P.C. Home » INSPIRATIONS » Hillside Modern Farmhouse by HouseWorks LLC and Reader & Swartz Architects, P.C. For this month’s Inspirations, we are beyond excited to share with you a home that is not only full of character and personality, but also several of our reclaimed flooring products. Situated on a large hill in picturesque western Frederick County, Virginia, the house was designed to take advantage of the million dollar view. Built by Houseworks LLC and designed by Reader and Schwartz Architects, P.C., this modern farmhouse is the perfect blend of reclaimed wood products and modern materials. 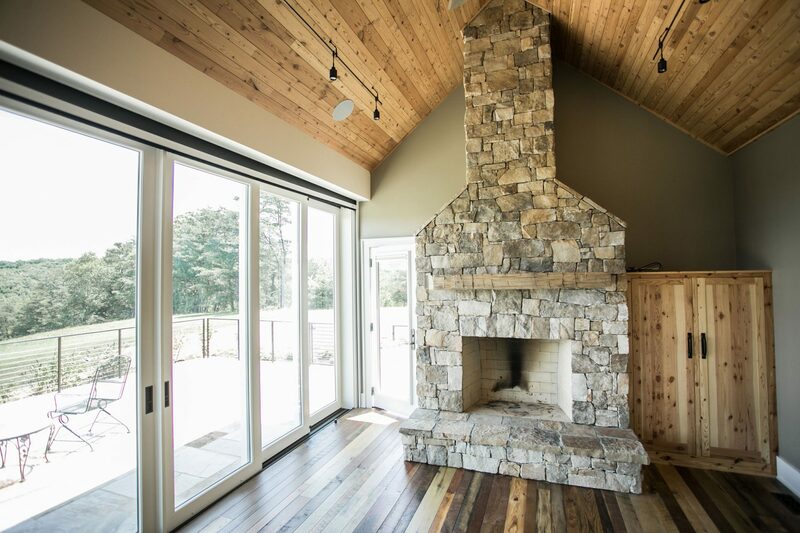 “When the Reynolds approached us to build their home in 2016, one of the first things they requested was to incorporate the wood from a log barn that had been taken down on their family property some years ago. We immediately thought of Cochran’s and hauled the hewn logs to their shop to see what they could salvage. The exterior of the logs were severely damaged by bug infestation but the paneling they milled from the heart of those logs turned out to be beautiful! We were able to feature this paneling on the ceiling of the Reynolds sunroom and had just enough left over to build them a cabinet in that same room adjacent to the fireplace. 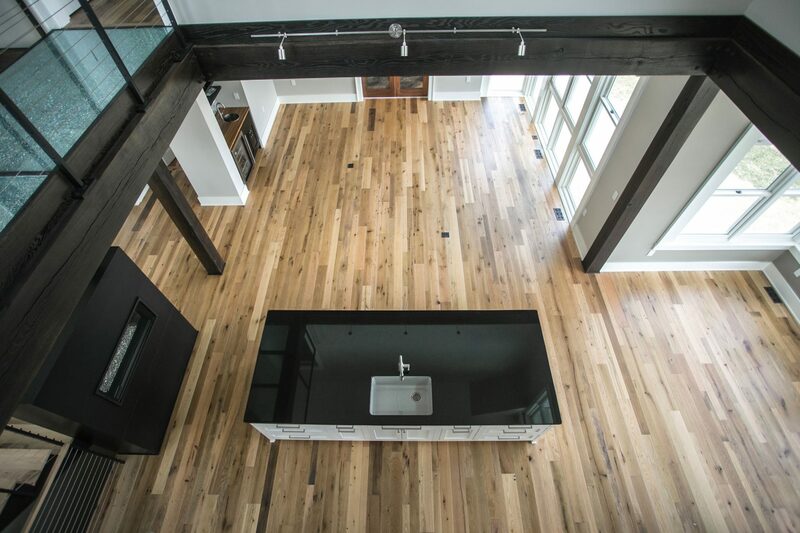 After touring the Cochran’s facility with our clients, they selected 5 different types of wood flooring to use in different areas in their home covering a total of 4000 square feet. This included Antique Chestnut, Antique Oak Milled, and Shenandoah Blend. When it came time to detail the stairs, reclaimed White Oak from Cochran’s was the natural choice as it was the best product to match the flooring in that area. The stone fireplace needed a mantle and nothing would be more fitting in that space than a rustic hewn beam, also from Cochran’s. With a diverse selection of colors, finishes and wood Cochran’s was able to satisfy a wide range of design patterns for our client’s home. Naturally rich in character and color from decades of being inside a working barn, our Wormy Chestnut flooring is as rare and beautiful as it is strong and graceful. 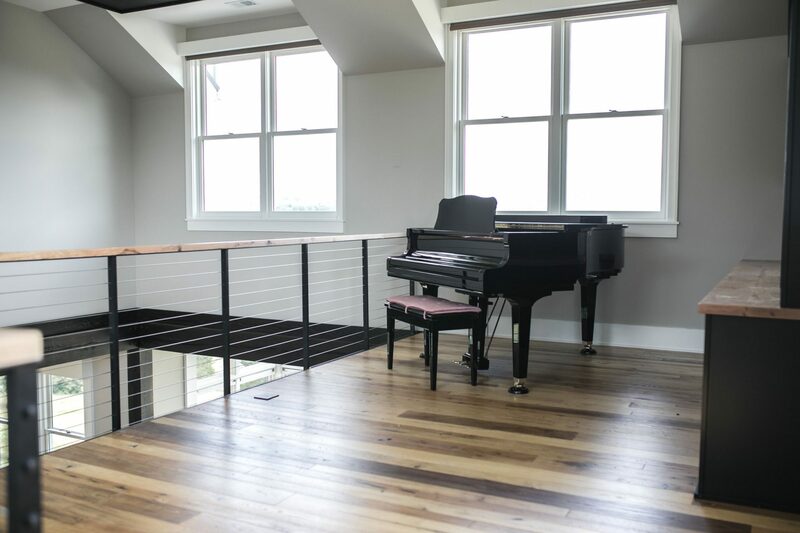 Our clients perfectly paired our timeless chestnut flooring with a modern glass catwalk that links the guest bedroom to the piano loft. Shenandoah Blend flooring was chosen for the sunroom. A blend of many materials, it contains remnants of Ash, Birch, Beech, Elm, Hickory, Maple, Oak, Locust, Cherry, and Walnut. The ceiling of this beautiful room features paneling that was salvaged from an old log cabin that was on our client’s family property. A hand-hewn log taken from Cochran’s mantel collection completes this stunning room. The majority of the main living area, including a spectacular open staircase, features our timeless Antique Oak Milled flooring. Combined with floor to ceiling windows and a modern double sided fireplace, our client’s home is a perfect open concept space for entertaining family and friends.